Is Your Face Wash More Harmful Than You Think? Like many Freshman here at Penn State I am currently enrolled in CAS 100A, also known as speech class. For my upcoming speech assignment, my class was instructed to select a social issue that we would then explain to a class as well as come up with a policy to correct the issue. I wanted to select a unique topic other than the typical topics of why texting while driving is bad or why marijuana should be legalized. After several hours of researching, I came across the issue of microbeads being used in cosmetic products and why they are extremely harmful. First you may ask, what exactly are microbeads. Microbeads are micro sized balls of plastic that are used in everyday cosmetic products such as soap, facewash, and toothpaste. While these small little beads may not seem come across as harmless, they actually are not. Microbeads are made out of plastic which means that they do not dissolve while a personal care product is being used. Because they do not dissolve, they end up being flushed down the drains. Although we have filtration systems in place with the purpose of filtering what is flushed down the drains, the miniscule size of the microbeads makes it nearly impossible for them to be filtered, thus allowing them to enter into our oceans and lakes. Microbeads are estimated to enter our oceans and lakes by the thousands every time we use a product, which results in hundreds of thousands of pieces of plastic being flushed into our waters daily. Researcher Sherri Mason wanted to find out for herself just how inflected our waters are with microbeads, so she went to the great lakes to collect data. Her findings were startling. She found that on average the lakes contained about 17,000 microbeads per square kilometer. 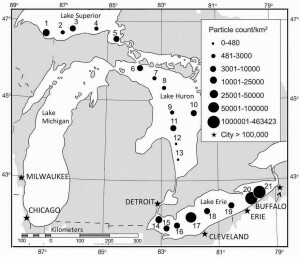 Even more startling results found that Lake Ontario contains 1.1 million microbeads per square kilometer. In addition to polluting our lakes and oceans, microbeads have other costly effects. Many marine animals mistake the microbeads for fish eggs as they have a similar resemblance, and end up eating the tiny pieces of plastic. Not only does this harm the fish as they have plastic in their bodies, but it harms us as humans as well. The food chain is alive and well. Fish eat food, and we then eat fish. But if these fish are eating microbeads, that means that we as humans are also eating the microbeads when we consume the fish. So now I wonder, when people become sick from eating fish, are they sick because it was undercooked or sick because they ate plastic microbeads? Researches have not yet been able to prove that microbeads are making people sick however it could be a cofounding variable. Now knowing what we know, would a rational person stop using personal care products that contain microbeads in them? I personally would stop using them, as it takes little effort for me to switch to a different brand that does not use microbeads in their products. However, everybody is different and some people may not see it as a problem. Researchers and myself are in agreement that microbeads are terrible for the environment and in fact are more harmful than people think. Zimmer, Russ. “Microbeads and the Ocean’s Plastic Smog.” TCA Regional NewsDec 29 2015. ProQuest. Web. 5 Oct. 2016. Corley, Cheryl. 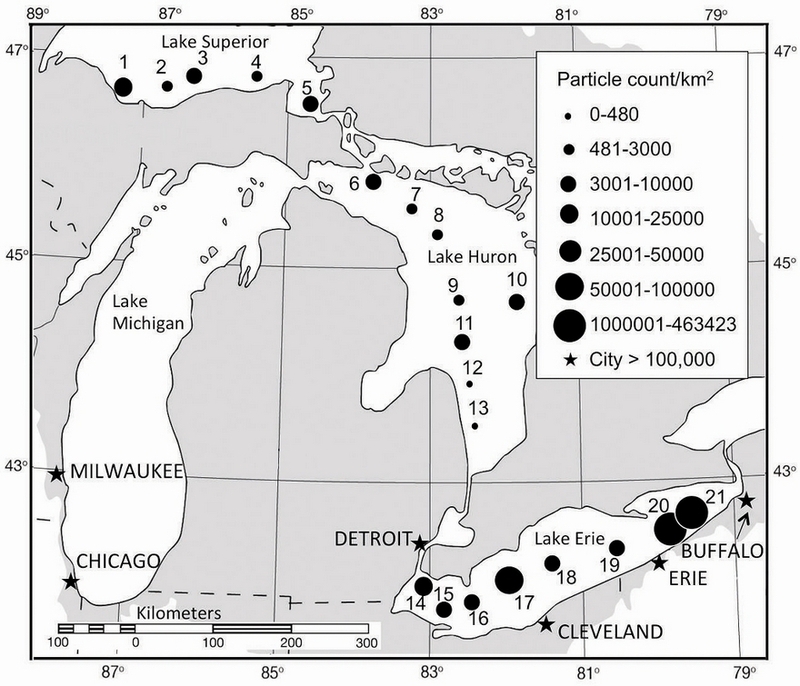 “Why Those Tiny Microbeads In Soap May Pose Problem For Great Lakes.” NPR. NPR, n.d. Web. 05 Oct. 2016. Altavilla, Nicole. “Banning the Bead.” American Spa 01 2016: 1. ProQuest. Web. 6 Oct. 2016. This entry was posted in Uncategorized on October 19, 2016 by sjb6039. I found this post very interesting because I have finally found my solution to perfect skin. As we go through our late teenage years, acne- FOR MOST OF US- is unfortunately a part of it. I never had bad acne, but I would get the occasional few pimples and slightly oil texture to my skin. I tried EVERYTHING just to make it one week with zero blemishes…but I never found a permanent solution to my problem- only temporary fixes. I didn’t even know what the cause was. I was eating healthy, working out, and sleeping on a good schedule. However, what I did not take into account was the amount of stress I was feeling. That was the source of the problem. That is what made my blemishes appear on my forehead. It wasn’t until this April, turning 20, that my skin automatically cleared up. My life became less stressful and I immediately noticed my blemish-free and oil-free skin. But it wasn’t just the reduction of stress that made my skin better. So what was it? What face wash was I using? Neutrogena? Clinique? Clean & Clear? Nope. I was using regular soap- plain old Dial soap. It was the cheapest and easiest solution to better skin. Yes, I realize I sound like a tacky line from TV commercial ad. But it’s true. It works for me. And the best part about it (which is why I just blabbed on about my skin dilemma) is that my routine of washing the plastic microbeads down the sink three times a day finally stopped. I was no longer adding to the problem of harming marine life and humans for that matter…Yeah, we eat fish too so it was harming our insides as well. Those plastic beads, as you mentioned in your post, do not dissolve. So where do they go when they are washed down the sink? They go to our bodies of water where fish and other creatures we eat swim. I learned about these tiny little devils last year when researching new skin products to use. I think everyone, with the exception of those who suffer from severe acne, should STOP using these harmful face washes. Go back to traditional soap, people. Is it worth poisoning our marine life? Is it worth getting sick over? We are only harming ourselves even more. There are many natural types of skin treatment you can use that may not work as fast, but will still show results. I was not patient enough to try those after failing so may times in choosing the right face wash for me. There’s still hope for other people to try. Or, there’s just plain old soap. Save the marine life! Stick to natural skin care techniques or just use plain soap! This post really shows how something we don’t even think about can have much larger consequences on the environment. There are probably dozens of other examples very similar to this one that are jut as easily looked over as harmless. It really shows how massively people can affect the environment when they don’t think they’re doing anything. Here’s an article that shows a few more things that you’d think are nothing, but actually impact the environment in surprising ways. Until I read this I had no idea what the microbeads were even made of. I had always thought they were just a hard gel substance that would simply dissolve after it went down the drain. Particularly, I have found these beads slightly annoying when I find them stuck in my eyebrows or facial hair after I get out of the shower. Obviously there is a problem with plastic beads being in cosmetic problems and ending up in the water, but what will be done about it? Even if it is not causing humans to become sick from eating fish, it is still not good for our waters. Companies might try to claim that it is not their fault because they just sell the product; they are not the ones physically dumping them into the water. A good solution would be either make companies stop using the microbeads or have them change the beads so that they are dissolvable in water and do not have any harm on the ecostystem. Wow! This was extremely eye opening for me. Your topic was very relevant and easy to connect with. 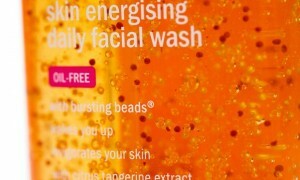 I personally use Neutrogena face wash that has microbeads in it. I never knew that they didn’t dissolve. I cannot believe that there was a product in the market that could cause this much damage! There are so many products out there that have exfoliants that aren’t made out of plastic. Still, Neutrogena seems to stay up top and one of the most popular. I love how you are getting the word out about this and informing people about how big of an issue this is. I also loved how you brought it back full circle and mentioned how it could be damaging our OWN health. Over all great job! I found out that Obama actually signed a bill in 2015 banning microbeads from US products that should be active by mid 2017. The UK and Austrailia are also now trying to follow in our footsteps.